Inspired by real life Twitter users frustrated with native capabilities while following hashtag (#tag) tweets from their friends. This application should help users to work with Twitter more effectively while spending less time searching for the information relevant to them. 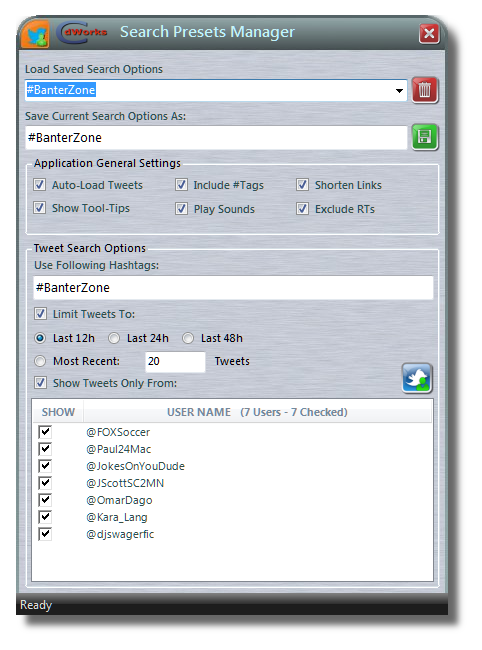 We hope that you'll enjoy this application as a compact and fast (loads in < 5 seconds) alternative to a browser based tweeting applications for hashtag or chat monitoring. 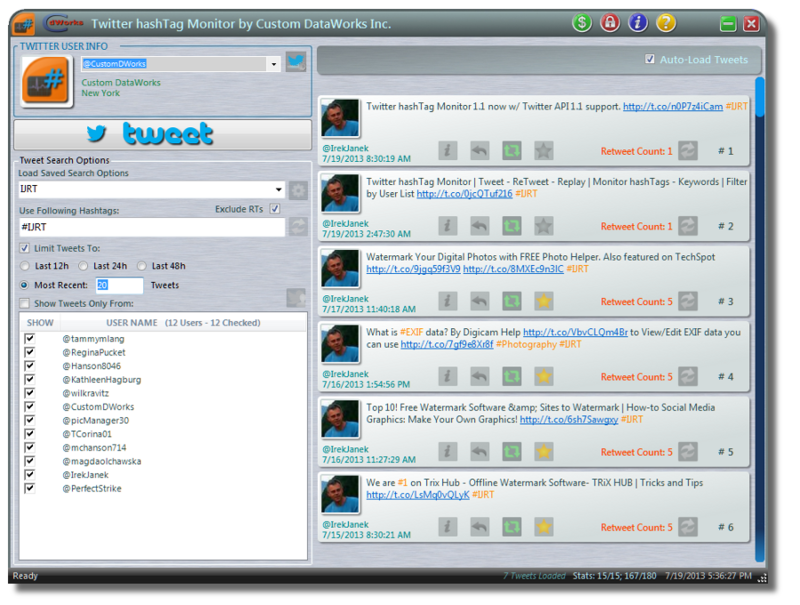 Download a copy today and see how easy it is to monitor tweets you are interested in. Whether you have multiple Twitter accounts or share a computer with others, once you connect and validate your Twitter account switching accounts is as easy as selecting the desired user from a drop-down list (Twitter Account Selection).. 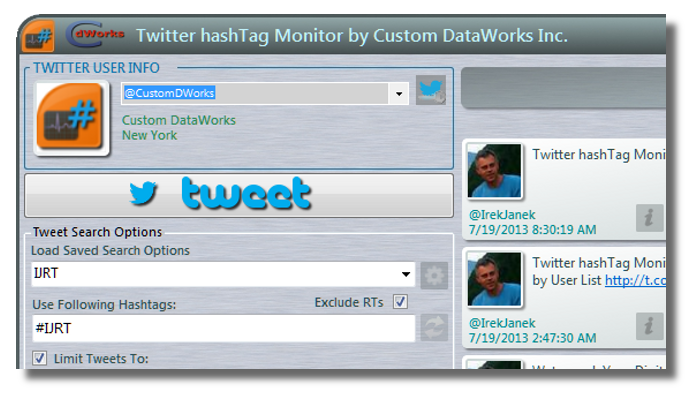 When you exit hashTag Monitor your last used search options and settings will be stored. Then next time you start your application the settings will be automatically loaded and depending on your selected options your last search will be executed and the tweets loaded for your review. To avoid showing too many search results and overwhelming user, we provided a few ways to limit your search results. All retweets are eliminated from the search results automatically. You can also limit the search results to the tweets from the last 12/24/48 hours (Twitter allows to access through the API only a week worth of tweets, to see older tweets you need to use Twitter in a browser) or to the number of most recent tweets. Once you create your search, you can save it as a preset search. Create as many as you wish and activate them with a single mouse click (Search Prests Manager). To help you even further filter your search results we provided an easy way to limit who will can show up as an author in your Twitter search results. You can create a list of people who are allowed to get your attention. 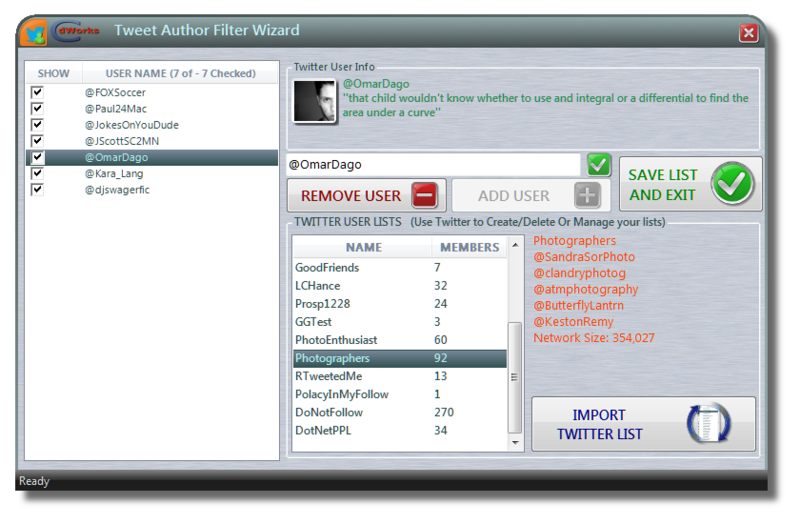 You can add them one by one or import an entire lists from your Twitter account (User List Manager). To see all tweet simply turn the filtering off. To minimize the time required to create a frequently used searches we provided you with an easy way to save the search parameters, along with the filter authors list, as a loadable preset. And now coming back your favorite search is only one click away. 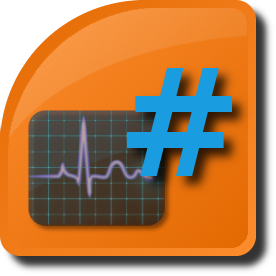 hashTag Monitor 1.0 had been designed and tested on Microsoft® Windows 7® (64bit) and to take full advantage of all its features we strongly recommend installing it on Windows 7® (64bit) systems. It also supports the following operating systems: Microsoft® Windows XP® Home and Professional Edition with Service Pack 3 (32bit) or Service Pack 2 (64bit); Windows Server® 2003 with Service Pack 2 (64bit); Windows Server® 2008 (32bit and 64bit); Windows Server® R2 (32bit and 64bit); Windows Vista® Home Basic, Home Premium, Business, Ultimate and Enterprise with Service Pack 2 (32bit and 64bit). 1GB (2GB for 64bit OS) of RAM, 2GB (4GB for 64bit OS) recommended. 1024x600 or higher resolution strongly recommended. Please download and install a DEMO version before buying a license. 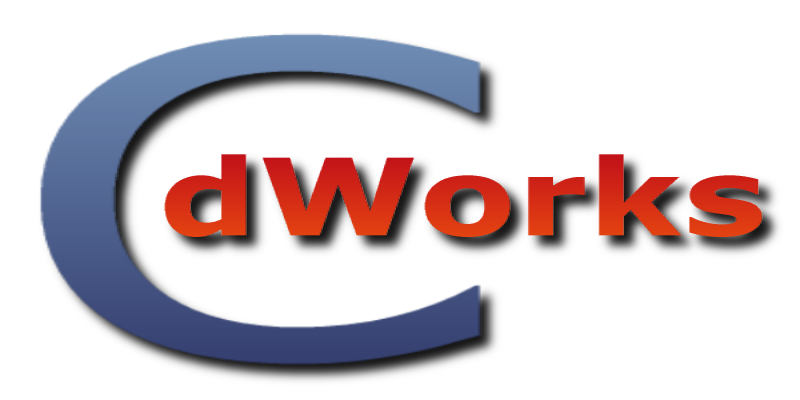 Once the hashTag Monitor is installed, purchase your license and use 'Registration Wizard' to complete the license activation.